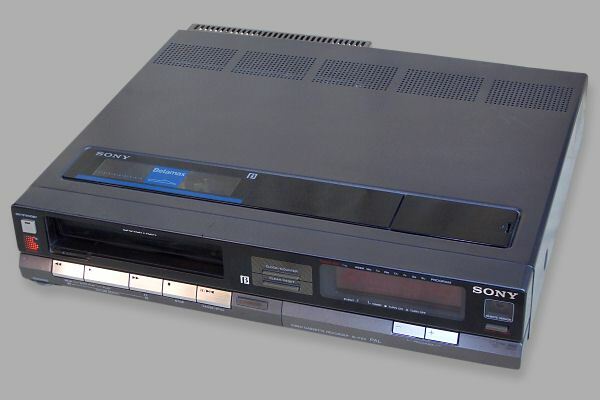 This VCR is almost identical to the SL-F30. Like the SF-30 it is incredibly slim at only 8 cm high. In order to get this height the individual channel selection buttons have been sacrificed in favour of up and down buttons. Another nice feature is the transparent hole in the lid to allow viewing of the video cassette. It differentiates itself from the SL-F30 by the fact that it has an Auto Play function. This allows the VCR to go into play automatically at the end of tape rewind or when counter zero is encountered. Besides the colour difference of going from silver to dark grey colour style, the F60 has one big improvement over the SL-F30 and that is perfect pause picture. It achieves this through the use of a third video head, the same as the SL-C9 model though you do not get the other slow motion options of that model. The SL-F60E model also had a voltage selector on the rear of the unit to switch between 110-127V and 220-240V AC (50/60Hz).